My family likes Kothu Parotta so much…Though it involves a lot of pounding, I still feel it is worth the effort. A perfect non-stick pan would even make this preparation easier.We do not have good Indian restaurants nearby. So, I have to look for a recipe that matches the exact taste of our Indian TamilNadu style Kothu Parotta. My search did not go vain…Thanks a lot to Em Samayal Pakkam for posting a recipe that gives the perfect taste of Kothu Parotta.This recipe is definitely a BLOCKBUSTER hit in my kitchen. When I have parathas and eggs at home, I make Egg Kothu Parotta. Certainly, a lip-smacking food! Cooked parotta – 4 nos. Green chillies – 1 to 2 nos. Cloves (Crambu/Lavangam) – 2 nos. 1. Heat oil in a pan. Add pattai and cloves. Now add onions and ginger garlic paste and saute till the raw smell goes off. 2. Add green chillies, turmeric, and curry leaves. Add tomatoes and fry for some time. 3. Cut parotta into pieces. Then add parotta pieces and fry for few minutes. Now add eggs, salt, and pepper. 4. When the eggs are almost done, add salna. Now break the entire parotta into small pieces using a ladle. Garnish with coriander leaves. Egg Kothu Parotta is ready to serve!!! 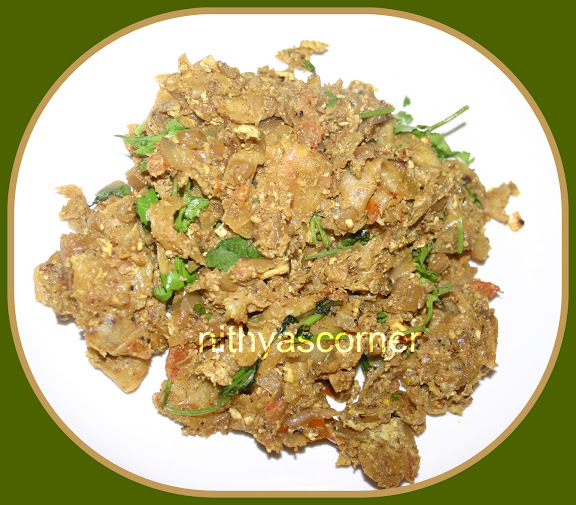 This entry was posted in Paratha and tagged Egg, Em Samayal Pakkam, Kothu Parotta on November 22, 2014 by vikashbhardwaz. I love any dishes that have potatoes in it and will always have potatoes at home. My daughter Sanvi also loves potatoes. Right now, potato is the only vegetable that she eats….hmmm…you got it! She is a fussy eater so how can I make her eat? I usually give her potato fry, poori potato masala, and potato podimass. 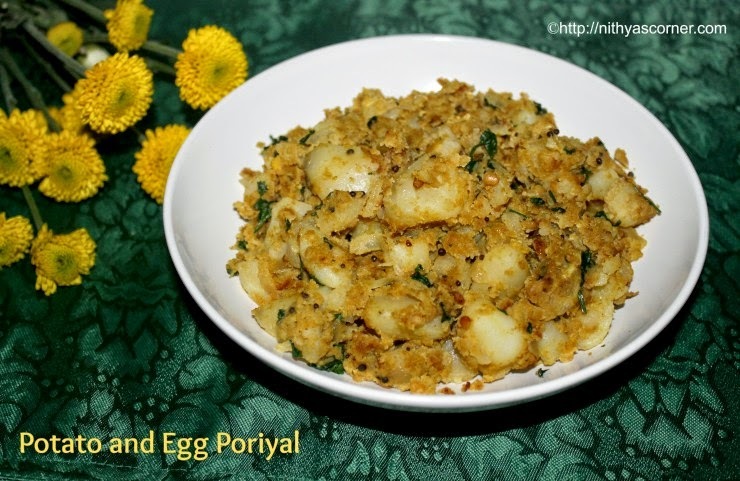 Then I wanted to try something different for her and that is when I tried this Potato and Egg Poriyal recipe. Sanvi loved it and so am I. It is very simple and tastes similar to the potato masala we usually make at home. Try it out and let me know how you liked it. Chopped Green Chillies – 2 to 3 nos. 1. Heat 1 teaspoon of oil in a pan. Add mustard seeds and let it splutter. Then add Urad Dal (ulutham paruppu) and let it turn light brown. Now, add chopped onions and fry until it turns transparent. 2. Add ginger garlic paste and fry till its raw smell leaves. Then add potatoes and stir well without mashing the potatoes. 3. Add turmeric powder, chilli powder and salt. Stir well and then add 1 tablespoon of water. Stir well again. 4. Break the eggs and add them one by one. Stir once and add little oil. 5. Add some more oil if required while frying the potatoes and eggs. At one point, the potatoes and eggs will blend well. 6. Add coriander leaves and stir well for one final time. 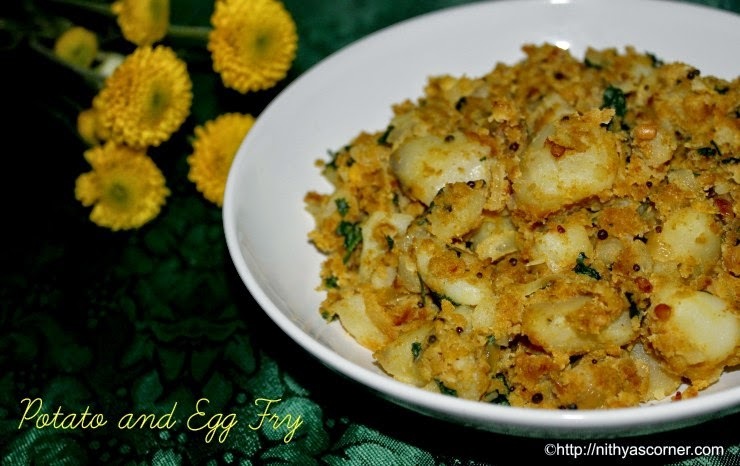 Now, Potato and Egg Fry is ready! Serve hot. Serve. With Sambar, Rasam, Kootu and Curd Rice. 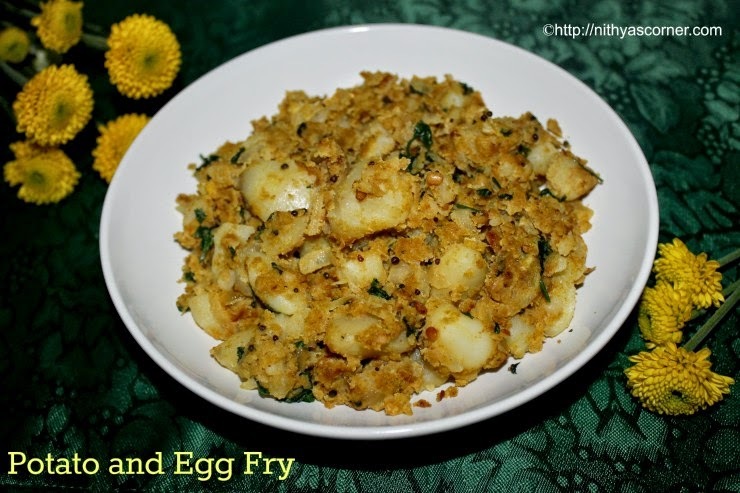 This entry was posted in Without Coconut and tagged Egg, Egg Fry, Ginger garlic paste, potato masala, Sanvi, Urad Dal on November 22, 2014 by vikashbhardwaz.